I did it! 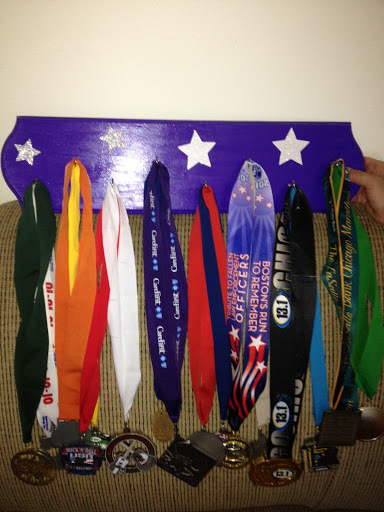 I made my own medals and bibs holder! On Thursday I went to Michaels and bought paint, brushes, nails, decorations (stars), and three pre-cut boards. I painted the boards on Friday and applied a coat of Super Gloss Mod Podge so that they would look shiny and let them dry overnight. Yesterday I added the hooks (from Target) and stars. I have a lot of medals and the same number of bibs. So, one holder won’t be enough and I definitely need more for the medals. 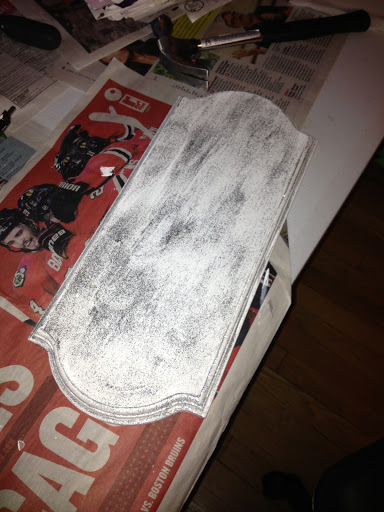 Since I had another board, I painted that white and added a coat of clear paint with glitter. I cannot wait to see the final results! It was fun doing these because my nephew helped me and I have plenty of time right now. However, I saw some other cute ones on Etsy and might buy 1 or 2 or I might just buy more boards and make them myself. At least I’ll save money because I have most of the materials and I definitely have time right now. Thanks to PavementRunner for inspiring me and giving me direction to make them. They turned out amazing! When you told me about this project in San Diego, honestly, I had my -0doubts. BUT- seriously good job on those! Would you say that you saved money doing it this way, or was the choice to make them so that you could design them how you wanted? They are SUPER cute! That looks AMAZING! 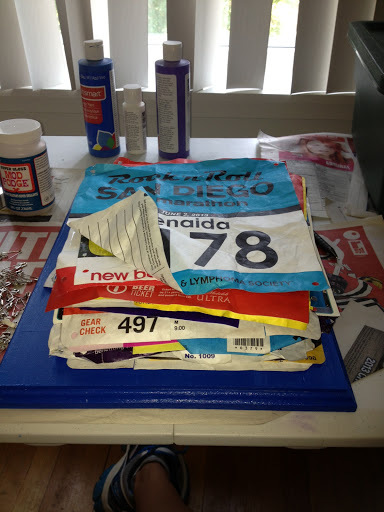 I already have a medal holder (pic on http://www.facebook.com/50by25) but all my bibs are in a shoebox. I'm now considering making a bib holder too – I had never heard of such a thing! Initially my idea was to get simply organize them and purchase those medal holders I've seen at the expo. However, if I remember correctly, those are not cheap! I made them because I thought it might be fun and make them how I wanted.